Buying or selling a property in Maryland is a big decision, which is why it’s more important than ever that you choose the right Baltimore Real Estate Agents to be on your side. We’d love to work with you! Learn more about us and why we do what we do. Jonathan Kirk, Owner/ Founder & CEO of the Kirk Home Group Of Northrop Realty, A Long & Foster Company. The Kirk Home Group Of Northrop Realty, Reside in Lutherville, In the county Of Baltimore, Maryland where Creig Leads Jonathan and his high performance team of Baltimore Real Estate Agents to continue growing their knowledge, experience, skill sets and client base, innovating the way the real estate is sold and acquired today. Jonathan is passionate about his family and providing value to all those he meets, without expectation of anything in return. 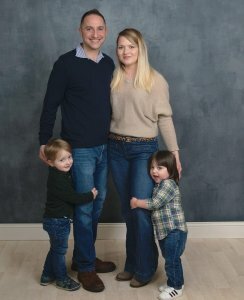 Jonathan and his wife, Deona, live in Lutherville, MD with their two young sons Lincoln (3) and Rockland (2). Kirk Home Group’s Dynamic approach to selling Baltimore, Maryland homes in today’s shifting market is required in order to continue performing for our sellers above the industry standard year after year. We utilize our high quality relationships with cash investors, other brokers & top professionals in the business, along with strong communication to ensure we sell your home the fastest, for the most money, every time, no matter what! Our Baltimore Real Estate Agents here at Kirk Home Group Of Northrop Realty, A Long & Foster Company, will always go one step further to ensure a successful and smooth transaction. Making the decision to buy or sell a home is no easy decision and its always in your best interest to have the best team behind you to support such a major life decision. If you are considering selling your home or purchasing a home you have come to the right place. We will help you no matter what. We consider ourselves mission based Baltimore Real Estate Agents. Baltimore is an amazing area and we’re proud to call it home. We are Baltimore Real Estate Agents who love living and working here in Maryland so much, it makes it easy to help local families and investors buy and sell local properties. Baltimore Real Estate Agents who know the local Baltimore Maryland real estate market like the back of our hand should be a given for any real estate professional you consider working with. Market knowledge can be the difference between you overpaying or getting a great deal, finding the right property or missing it, and buying a property fully informed or missing critical things during inspection that can cost you. As Baltimore Real Estate Agents we are fully aware of the emotional roller coaster that can occur when either buying or selling real estate. We are specialized in handling these matters in calm and professional manner so you as the client are completely confident in our abilities 100% of the time.